The work flow of fingerprint unlocking can be summarized into three steps: 1. Establishment of fingerprint database; 2. Acceptance and judgment of fingerprint information; 3. Output of judgment results. After the intelligent fingerprint lock is installed and checked, it is necessary to input the fingerprint information to the intelligent fingerprint lock administrator to define the identity of the lock administrator. After setting up the administrator, the administrator must be authorized to input the fingerprint information of family members and establish the fingerprint information database. Generally, the better intelligent fingerprint lock also has a large fingerprint storage capacity, such as the Intelligent Fingerprint Lock in India can enter up to 300 fingerprints. 2) fingerprint information reception and judgement. When the user presses the fingerprint lock sensing module with his finger, the fingerprint sensor immediately transforms the fingerprint pressure into photoelectric information, and compares the obtained information with the information in the fingerprint database by lightning. 3) output of judgment results. When the conduction information is compared with the information in the fingerprint database correctly, the system determines that the fingerprint is the master fingerprint, and transmits the processing results to the door lock and voice prompt unit through the power control box to unlock the door. Conversely, the voice prompt fingerprint is not entered, and will not open the door. Operation steps: <1> open the battery cover. <2>press the setting button to ring the drip sound once. <3> press the start key (next to the keyboard number 3) and enter the password (3-8 bits) by pressing the key. Operational steps: 1. Open the battery cover 2. Press the settings key once. 3. Press the start key, enter the password (3-8 bits) press the key 4. Press the start key, input the number (00-99) press the key. 5. Press the start key, enter the open door (3-8 bits), press the # key to end, the password is set successfully; the fingerprint will be pointed at the fingerprint window to read the fingerprint, drip sound, and then again the same finger press read the fingerprint. Two times read the same sound, indicating the success of fingerprint input; will set the card close to the induction area, set the induction card; press any key of the remote control, set the remote control. Three. delete the open door card, password, fingerprint, remote control. 2. press the set button two times continuously. 3. press the start button to enter the administrator password and press the button. 4. press the start button to enter the fingerprints, passwords, remote control numbers, and button numbers to be deleted. For example, to delete a fingerprint, point your finger at the fingerprint window to read the fingerprint, the card to be deleted is close to the sensing area, and press any key of the remote control. Four. delete all cards, fingerprints, remote controls, passwords (administrator password will also be deleted). 2. press the set button three times continuously. 3. press the start button to enter the administrator password. 4. finally, click the button. The emergency key, as the name suggests, is the key to respond to emergencies. You know, even a good fingerprint lock brand will happen. Emergency keyholes are usually concealed. Satellite's fingerprint keyhole is located at the bottom of the panel. You can see the key jack. Insert and rotate the key to open the lock. Fingerprint password lock is generally used by lithium battery power supply, and fingerprint password lock or dual power supply, that is, with dual protection lithium battery can be used 200000 times, absolutely electricity saving and environmental protection. The fingerprint code lock also has the power supply low voltage alarm function, when the power supply voltage is lower than 4.8 volts, there is a voice prompt you to replace the battery in time. In case the battery is not replaced in time, the fingerprint password lock can also use external power supply, as long as access to emergency batteries can achieve unlocking. The use of fingerprint locks is easy to master. But there are still some settings to pay attention to. Attention should be paid to user settings. Of course, the operation methods of different brands will be different. 1. This product applies for fingerprint, password, card, APP(optional). 2. Support remote control function, efficient and convenient. 3. 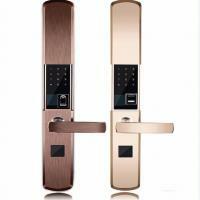 Have strengthens security level of the door lock. 4. User addition and deletion based on sector number management. 5. Have anti-peep password function. 6. All components are used internationally renowned brand name products, stable and reliable quality. 7. All of door lock modules are waterproof, moisture-proof and anti-virus. 8. All of door lock module can adapt to harsh environment. 1 year warranty for whole machine, not including the man-made damagement or damaged by wrong operation or change the inside constructure without engineer admit. During the warranty time, we would send the spare parts for repair, the spare parts that have provided together with the whole machine would not provide for free again. 1, Would I need to fingerprint lock all the year round? Running a fingerprint lock from early October until the spring is generally sufficient as more moisture is generated during the winter weather. It's also better to start using your dehumidifier before the winter starts; this reduces the risk of moisture soaking into your walls. 2, Are you a factory or trading company? Please tell us the supplying area size (length*width*height), and the RH you need. We will study and suggest you the right model. 4, Can we buy a sample for testing? 5, if the fingerprint lock doesn't work well, what shall I do ? 6, What about delivery date? Product can be sent to you within a week if there is stock after receiving deposit or 100% payment from customer. If there is no stock, the delivery date will be 30 to 40days. 7, How to choose a fingerprint lock? The simplest and the least precise way to determine the dryer's efficiency is by choosing it according to your room's cubic capacity. It is recommended, that an hourly air flow through the device is at least 3,5 times higher than the total volume of the room. When fingerprint collectors begin to use locks, these problems arise: fingerprint entry and deletion need complicated operation, not convenient enough, fingerprint shallow, peeling, dirty hands and other personnel identification is not very sensitive, of course, these problems still exist, but now the technology is more mature than before, for example Son, Erford Intelligent Lock, Erford Intelligent Lock is a fingerprint collection with automatic memory repair function. But with the constant development of the industry and the constant updating of technology, the intelligent lock can not only configure ordinary radio frequency cards, but also configure identity cards, bank cards, residential entrance guard cards and so on. It is safer than traditional radio frequency cards, because such sensitive things as ID cards and bank cards are relatively a guarantee for people. The sense of protection is much stronger. Six steps: 1, press 0# to enter the menu password entry column. 2. Enter the management password (e.g. the initial password of Erfurt: 01234789, # key confirmation) to confirm 3. Then you can view the menu from left to right. For example, if I want to enter a new fingerprint user, then 4. User management (e.g. Erfurt Intelligent Lock, jumping in to add a user, it will have a primitive system username and it will be able to call for its own life. The user name is entered in English, numerals, and Chinese. 6, user edit, add key (fingerprint, password, card, remote control, etc.) to add the key to complete the whole process, and every step of these six steps will have voice prompt navigation. But voice navigation usually uses official languages, such as Mandarin Chinese and English, which makes it inconvenient for some elderly people. Of course, the most official linguistic basis for consumers who can accept intelligent locks is still there, which is a small part after all. 4) Anti prying alarm function. For users with complex living environment, this function is more effective. In fact, how much hatred does it take to break a lock? If that happens, do you think people who do it care about using other methods? 5) The function of the virtual cipher. The virtual password function means that when you enter the password, you can enter any number before and after the correct password. As long as the password in the middle is correct, the function can be implemented to open the intelligent lock. This function effectively prevents others from peeping into the password, and can also be extended. The length of your password, even if you peep at it, may not be remembered, but you can't rule out the possibility of other means of memory, so some manufacturers have developed virtual scrambling, which means that the virtual password added before and after is accompanied by a system-specified scrambling code, such as the first password input, The system gives you the first three scrambled codes 123, which can be used correctly for the first time, but not for the second time, because the second system may give you only one scrambled code or 12 or 134, thereby reducing the risk of snooping passwords. 6) remote control unlock function. Moreover, the remote control distance is too short, the general remote control distance can not be calculated through the wall distance, have to bypass the wall distance to calculate, if your house is larger or villas, duplex buildings, then the remote control distance requirements are more stringent. In fact, there are still a lot of hidden dangers for us to unlock the locks remotely. If this unlocking method is implemented vigorously and all intelligent locks in the market are labeled, the consequence will be the intervention of black hat. This way of obtaining passwords is more technical than mechanical keys, fingerprint copying, password peeping, etc. Magnetic card copying and other means of crime are much easier to come by. Because the network can be controlled systematized or regionalized.